We believe that a great nail service is not only created by our skilled team members, but with high-quality products as well. We are proud to use only the top brands to provide services to our valued customers. These brands have been selected for their outstanding quality in order to provide you with consistent results that will exceed your expectations. Dr.’s REMEDY® is a line of podiatrist-formulated nail care created by board certified podiatrists Dr. Adam Cirlincione and Dr. William Spielfogel. Our collection of products at our Naples nail bar includes over 40 luxurious nail colors as well as nail care solutions, which can minimize the appearance of dry or brittle nails, hydrate nail cuticles and improve the wear-time of your nail color. 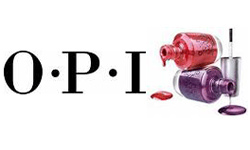 OPI is globally renowned for its nail lacquers – a brilliant, chip-resistant, professional formula available in over 200 fashion-forward colors. With clever names that customers look forward to with each new collection, OPI nail lacquers are beloved around the world and trusted by professionals. Neither OPI nail polishes nor any other OPI product or service is subject to animal testing, making it a go-to choice for people heading to our nail salon in Naples looking for a cruelty-free option. Powder Perfection: Acrylic Services Reinvented. 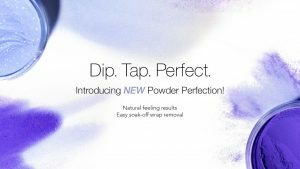 Faster, Easier & Odor-Free, OPI’s dipping powders are a quick applying, odor-free acrylic alternative that promotes a clean-air environment while offering gel-like shine and weeks of wear without the need to light-cure. 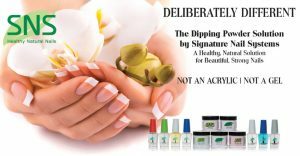 Those looking for a dip manicure in Naples will love this brand! CND products have been developed since 1979. It provides the salon and spa the highest quality products and services for hands and feet. 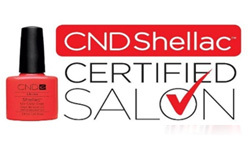 They are available for purchase only through the finest salons, spas, and beauty supply stores, so a nail bar that carries CND is a good sign. Their best innovation is shellac gel polish, which is a long-lasting product with mirror shine, zero dry time, and no nail damage. Signature Nail System is a company that has more than 20 years of experience in dipping powders and powder manicures. It provides a dipping system that is natural and healthy to the real nails. The vitamin E and calcium-fortified SNS gels help keep nails naturally healthy and strong, and we are happy to offer SNS Nails at our natural nail salon.